I'm not exactly a fashion forward type of gal. Heck, I wear pajamas more often than I do 'regular' clothes. (Working from home has it perks, with this being one of them!) My husband is quite the opposite since he usually does the whole suit and tie bit most of the time. We often joke that he's quite the metrosexual since he seems to be more into fashion than I am. When we go shopping, he makes a beeline towards clothes, shoes and electronics whereas I'm the one hitting up the housewares, kitchenwares and books/magazines. But I'm slowly getting into fashion. Does it count that I'm starting to like wearing aprons when I'm working in the kitchen? Speaking of fashion, I do know that chiffon just isn't a kind of fabric - it's also a cake! Chiffon cake is very similar to angel food cake because of it's use of whipped egg whites that make up the cake batter. The difference between the two is that a chiffon cake will use vegetable oil whereas the angel food cake does not. This is the last of my Olive Garden-inspired recipes I've tried this week. I chose this recipe because next to Tiramisu, this is my second favorite dessert on Olive Garden's menu. As I was scanning over this recipe, I knew it wouldn't turn out like the Olive Garden version. The recipe is for a chiffon cake and the restaurant version clearly is not. In fact, of all the Olive Garden inspired recipes I've made this week, this one is the one that least is like the restaurant version. Despite the lack of similarity to the original, the cake recipe is delicious. Light, airy with bright lemon notes throughout the batter and filling, it's a perfect way to end a heavy pasta meal. The only issue I had was with the lemon pie filling called for in the recipe. I kept debating whether to make the recipe as is or to adjust it to my preferences. I ended up following the recipe but if I were make this again, I'd make one substitution - prepare homemade lemon curd (like this one) in place of the lemon pie filling. The use of lemon pie filling from a box or can just didn't pair well with the cake. So if you make this, go with the lemon curd. Ha! And my husband thinks I lack fashion sense. I know darn well about chiffon... cakes, that is! In a large bowl, combine flour, baking powder, salt, and 1/2 cup sugar. Add oil, egg yolks, water and lemon rind. Beat with an electric mixer until smooth. In another bowl, beat egg whites and cream of tartar until peaks form. Gradually add 3/4 cup sugar, and beat until very stiff and shiny peaks form. Fold 1/3 of the whites into the batter, then quickly fold in remaining whites until no streaks remain. Turn batter into ungreased 10 inch tube pan. Bake in the preheated oven for 60 minutes or until a toothpick inserted in the center comes out clean. Invert cake and cool completely in pan. When cool, loosen edges and shake pan to remove cake. Beat cream to stiff peaks. Fold in lemon filling of lemon curd. Chill until stiff. Slice cake horizontally into 2 equal layers. Fill layers with 1/2 cup of filling. Spread remaining filling on top layer. Yum Yum little miss!!! This looks scrumptious! Can I have a piece now?! 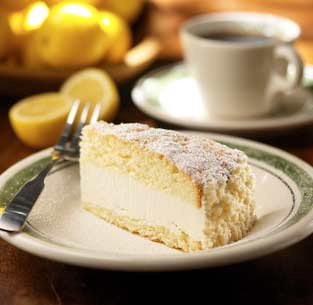 I've never had the Olive Garden version, but I love the whole concept of lemon cake with lemon filling. And I'd definitely go with lemon curd too. This LOOKS and sounds incredible! 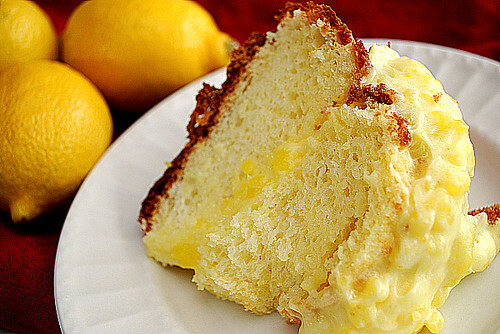 Lovely lemon cake! I've never tried olive garden's but I think I would rather have yours! The crumb on that cake looks really lovely. It is certainly interesting for me to read this post. Thanks for it. I like such topics and anything that is connected to them. I definitely want to read a bit more on that blog soon.